Caprio’s Hair Studio based in Kingswinford is a Great Lengths GOLD Status Salon and specialises in hair extensions. 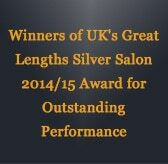 Recognised for our expertise we won ‘Silver Salon of The Year’ for outstanding performance 2014/15 and the following year were promoted to a Gold Status salon. Since then we have gone on to become finalists for 'Gold Salon Of The Year' & 'Classic Volume Creation Of the year' 2016/17 and again in 2018/19. So you see we are experts in extensions and have been duely rewarded for our skills by Great Lengths themselves. 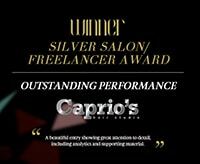 Caprio’s was established in 1998 and so have many years’ experience transforming ladies hair into the hair they have always dreamed of using Great Lengths hair extensions. Great Lengths are premium hair extensions and have been the world leaders for over 20 years. Great lengths offer 3 application systems, however we choose the ‘cold fusion’ application, which is a single strand application system that delivers virtually no heat during the process. We produces small flat bonds which fan out the individual strands of hair which are also virtually undetectable. The hair will feel and look totally natural. Cold fusion creates virtually no heat and produces amazing results and longevity whilst offering further protection for those with finer, heat sensitive hair. The unique polymer bonds are PH balanced so do not damage the hair and deliver long lasting results. Great Lengths are the only hair extension company to source and produce their own hair. They can confidently guarantee the origin, quality, ethically and traceability of all Great Lengths hair used in a certified salon like ours. The hair is ethically sourced where the hair has been donated to the Hindu temples.This religious act has been carried out for many years. The proceeds are then put back into the community to help aid the development of temples, medical services, schools and many other charitable concerns. We believe for hair to look, feel and behave like real hair, it needs to be 100% human hair. From beautiful blondes, rich reds and glossy brunettes Great Lengths colour range offers something for everyone. The classic colour range consists of 55 base shades, 17 0f which are various shades of blonde ensuring a flawless fusion. We usually apply a combination of two or more shades to produce a natural result. Also available are great Lengths Flowstrands for a dip dye colour effect and Great Lengths Rooted strands for the root stretch trend so popular at present. We do sometimes also pre-colour the extensions if we feel the colour match isn't exact so we can guarantee a flawless result. For those of you that like the current trend of soft pinks, lilacs, mint greens etc then there's also a range of fashion shades to choose from. How are Great Lengths hair extensions applied? We have a team of four extension experts with various levels of experience. Our team are all fully qualified and certified by Great Lengths themselves. You will only ever have an experienced stylist/extensionist applying your extensions. At Caprio’s we use the cold fusion method to apply our hair extensions. This is the BEST application option to apply Great Lengths hair extensions. The bond is wrapped around a small supporting section of hair, and secured in place using a Great Lengths application method. The application process can take between 2 and 4 hours depending on how many individual bonds are required. Our team of extension experts will carry out a thorough in depth consultation, explaining everything you need to know on how to maintain and get the best out of your new hair. Great Lengths will transform your hair with stunning results lasting between 3-5 months if well maintained, however in some cases have been proven to last longer. Once they're ready to be changed you can have them removed and a new set applied on the very same day so there's no need to worry about not having them in for any period of time. You do however have to wait 48hrs after having a colour application before you can have extensions applied, this is due to the change in Ph balance of the hair from a chemical process. How much are Great Lengths Hair Extensions? How are Great Lengths Hair Extensions removed? Once your extension have reached their life span we will remove them for you in salon. You may loose a few during the 1-5 month period you've had them in, this is due to the fact that on average we loose about 100 hair a day. Because the extensions are wrapped around your own stands of hair once they are naturally released from the scalp there's nothing for the extension to stay attached too, hence why you may over time loose a few strands. However you will not under any circumstances naturally loose them all which is why we will remove them for you using a gentle solution formulated by Great Lengths to disintegrate the bond. Once we've removed them all we will comb the hair through , cleanse, trim and style your hair in preparation for the next set or not if you'd prefer. There is a small charge for removals as this can take around 2 hours from start to finish. Prices are on consultation which is a free, no obligation service. Application for the full head can be in excess of 3 hrs or more and prices from £300-£1000 depending thickness, length and colour selection. Unlike other extension brands, you won't need to visit the salon every couple of weeks to have the extensions realigned, providing you look after them and follow the guidelines your Stylist has given you , once they're in they will last you between 4-6months.